A new STEM solution for marine debris is now sweeping the waters of the Pacific Ocean! The Ocean Cleanup is an international organization dedicated to freeing our oceans of plastic. Their energy-neutral device uses a float and skirt system to catch marine debris. 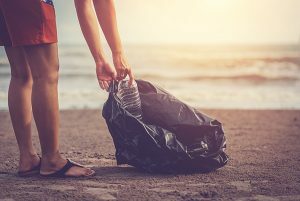 According to The Ocean Cleanup scientists, most marine debris such as plastic bottles can be found at the very top of the water column. While the device’s float keeps the system near the top, the skirt catches marine debris as deep as 10 feet below the surface. The large mass of The Ocean Cleanup device causes it to move faster than the plastic, trapping the trash against the floats and the skirt. Ships will periodically visit the device and remove the trash the device collected, hopefully for good! 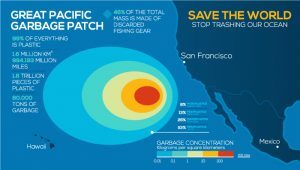 The target of The Ocean Cleanup’s system is the Great Pacific Garbage Patch, a collection of marine debris that is twice the size of Texas. Ocean currents bring trash from all over the Pacific to this central location. Because the device is a free-floating design, it is able to hitch a ride on these ocean currents towards the Pacific Garbage Patch. This structure is also animal-safe, allowing marine creatures to swim free underneath it. Larger marine creatures have no risk of becoming entangled in the rope-free design! The Ocean Cleanup was started by Boyan Slat in 2013. After a simple Ted Talk, his idea generated millions of dollars on Kickstarter. His company’s U-shaped engineering marvel is expected to remove half of the Great Pacific Garbage Patch in just five years. Slat anticipates that more systems will be added to the fleet, increasing the global impact of this STEM Solution. System 001 was deployed in early September from San Francisco. See where it is in real time by visiting its Live Location page and read more about The Ocean Cleanup by clicking this link.